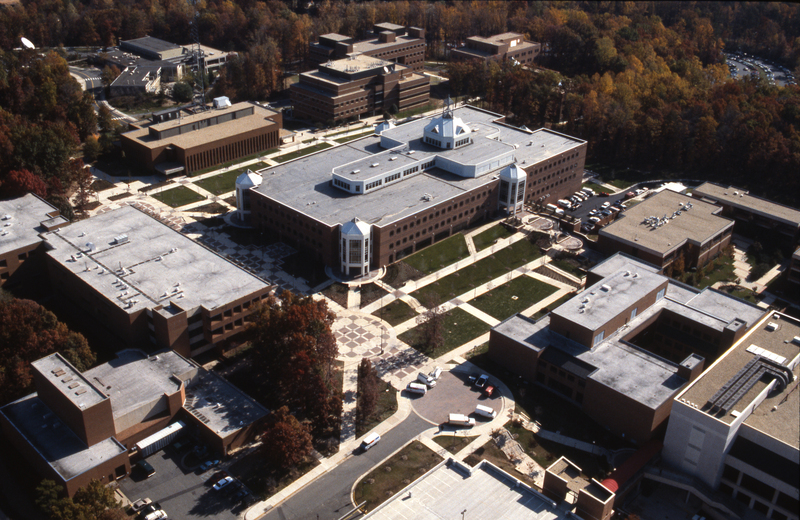 The George W. Johnson Learning Center, better known to George Mason University students and faculty as the Johnson Center, or simply the “JC,” is easily the most recognizable building on George Mason’s Fairfax Campus. Its image has been used as a symbol for the University. Its distinctive cupola can be seen from nearly all corners of the campus. The Johnson Center serves as both a location for academic pursuits and a meeting place for members of the Mason community and the local Fairfax Community. Both the green clock tower and the bronze sculpture of George Mason at both ends of the North Plaza in front of the Johnson Center are campus landmarks. The story of how the center came to be built begins interestingly enough in the administrative offices of Fenwick Library. In the mid 1980s, it became clear to Director of Libraries, Charlene Hurt that that Fenwick Library, which was comprised of the original 1967 building and the connected Library tower, was becoming insufficient for the expanding student and faculty population. The library tower was built during “Phases II and III” of the library expansion plans with A and B Wings completed in 1974 and 1983 respectively. Extensive plans were being drawn up for what was called “Phase IV” of the Fenwick Library expansion. Phase IV would add a second library tower (or more accurately, one half of a second library tower). The remaining half of the second tower was to be built during “Phase V” of the expansion. Faculty members were consulted in 1988 and asked for their opinion as to what features the new library tower should contain. It was suggested, among other ideas, that an informal lounge and a coffee shop were essential to making this new library addition more useful and welcoming to researchers. Faculty suggestions that the library integrate other useful campus functions would re-enter the discussion as the simple library expansion idea evolved into that of a larger self-contained building. In the very early 1990s, planning for a University Learning Center in lieu of the library expansion began to evolve among library, faculty and other university administrators. This center would to include not only a state of the art library, but also a media center, bookstore, a movie theater, meeting rooms, a restaurant and a food court. The building would be the new center of campus, although the University made certain to point out that this building would not be “Student Union Building III,” nor would it replace the two existing student unions. Up until the facility was opened, a popular rumor spread around campus that a bowling alley was part of the plans. University administrators were quick to deny such speculation. In order to build the University Learning Center, university administrators needed to remove a structure dubbed the Humanities Module, which had previously occupied the space where the new building was to be built. The Humanities Module was a series of large temporary buildings which housed classrooms and lecture halls. The module was host to subjects such as literature, economics, and music appreciation, from small classes to 100-student lectures. The buildings that made up the Humanities Module were arranged in such a way that students sometimes had to walk through other class and lecture rooms in order to move throughout the module. The Humanities Module was finally demolished in 1993 in order for the land to be cleared for the new Learning Center. Modular classrooms continued to be in use at the University until the mid 2000s, and some modular offices are still in use at Mason today (2012). The University Learning Center, which was designed by Sheppley-Bulfinch Architects of Boston Massachusetts, was modeled after several existing buildings in the United States. The design called for a ground floor which would have a large meeting area (today’s Dewberry Hall), a lower level of the planned bookstore, a staircase which would rise all the way to a third floor and a “pub” area (today’s Bistro). The original first floor plans are almost identical to the current layout of the Johnson Center, although they did not specifically name computer store or mail facilities on that level. The remaining drawings for the second and third floors accurately depict the layout of the current Johnson Center today. The University Learning Center’s construction was completed in late spring of 1995. Administrators pushed for library staff and furniture installers to have the inside of the building ready for the new academic school year, although library supervisors expressed the concern that it would be difficult to hire and train new staff before the deadline. The first part of the University Learning Center opened in October 1995 to much fanfare. The new building was almost “twice the size of the Patriot Center,” contained multiple computer labs and a 315-seat cinema. The building cost $30 million to build and contained over eight acres of floor space. Taco Bell, Sub Connection, and the Bistro were among the original restaurants serving food in the University Learning Center. La Patisserie, originally based in Student Union Building I, moved to the Center just in time for its opening. Pizza Hut rounded out the food choices. In August 1995, George W. Johnson, the University’s president since 1978, announced that he would retire at the end of the school year in 1996. Dr. Johnson at that point had been arguably Mason’s longest serving and most successful president. During his tenure, the university had expanded from a medium-sized local institution into a nationally-recognized university with distributed campuses in Arlington and Prince William, a law school, and doctoral programs. To honor Dr. Johnson’s service and accomplishments, the University Learning Center would be dedicated to him and bear his name. On April 12, 1996, the University Learning Center was renamed the George W. Johnson Learning Center in a ceremony held on the North Plaza. Former Rector of the Board of Visitors and pivotal partner with Johnson in the expansion of the University, John T. “Til” Hazel gave the keynote speech. During the same ceremony, the eight-foot tall statue of George Mason, sculpted by Wendy Ross was unveiled. Ross later created the George Mason Memorial in Washington D.C. Since its dedication, the Johnson Center has been host to a number of memorable and important university and community-related gatherings. In 1998 it was the home of the World Conference on Information Technology, which was attended by many leaders in that field and featured appearances by former President of the Soviet Union, Mikhail Gorbechev and former British Prime Minister Margaret Thatcher. The Center was filled to capacity during the 2006 NCAA Basketball Championship Tournament, when George Mason’s Patriots advanced to the Final Four by defeating the top-seeded University of Connecticut in overtime on March 24. Giant television screens placed on the atrium wall above the entrance to the Bookstore at the north end permitted viewing by those in the packed atrium and on the floors above. In 2007, then Senator Barack Obama gave a pre-election campaign speech inside the Johnson Center. In 2008, former President Bill Clinton and Senator Hillary Clinton spoke at separate rallies for then-presidential candidate Obama at the Johnson Center. The George W. Johnson Learning Center still remains a focal point on the Fairfax Campus. It is a gathering place for the Mason community and an outward sign of the work that Dr. George W. Johnson had done to help make George Mason University what it is today. Browse items relating to the George W. Johnson Learning Center.